The world food situation is starting to get very, very tight. Unprecedented heat and wildfires this summer in Russia and horrific flooding in Pakistan and China have been some of the primary reasons for the rapidly rising food prices we are now seeing around the globe. In places such as Australia and the African nation of Guinea-Bissau, the big problem for crops has been locusts. In a world that already does not grow enough food for everyone (thanks to the greed of the elite), any disruption in food production can cause a major, major problem. Tonight, thousands of people around the world will starve to death. So what happens if things get even worse? Many agricultural scientists are now warning that global food production is facing dangers that are absolutely unprecedented. Crop diseases such as UG99 wheat rust and the “unintended effects” of genetic modification pose challenges that previous generations simply did not have to face. The outbreak of a real, live global famine looks increasingly possible with each passing year. So are you and your family prepared if a global famine does strike? You better get ready – these raw material prices will filter down to U.S. consumers eventually. So what is going to happen if the world food situation gets even tighter? 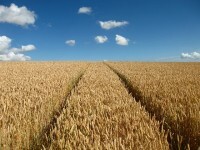 The following are 5 potential dangers to global crops that could dramatically reduce the world food supply…. A recent article in the Financial Times contained an absolutely stunning quote from one prominent agricultural scientist…. Later on in the same article, Coffman warns that this disease could cause a devastating famine in which literally millions of people would die…. For example, about 10 years ago Chinese farmers began to widely adopt Monsanto’s genetically modified Bt cotton. Well, researchers have found that since that time, mirid bugs that are resistant to the Bt pesticide have experienced a complete and total population boom. But that is what we get for trying to “play God”. For example, if nearly all farmers start using the same “brand” of genetically modified plants that are all virtually identical, it sets up a situation where crop diseases and crop failures can cascade across the planet very easily. It has been said many times that genetic engineering is similar to “performing heart surgery with a shovel”. So what is going to happen if we start seeing widespread crop failures in the coming years? The global food supply is not nearly as stable as most people believe. At some point, it is going to be tested severely.